IPOPI is delighted to announce that the PIDs Principles of Care were published in Frontiers in Immunology on December 15th, 2014. The publication aims at providing guidance to decision-makers and healthcare professionals throughout the world on the different aspects affecting PIDs. 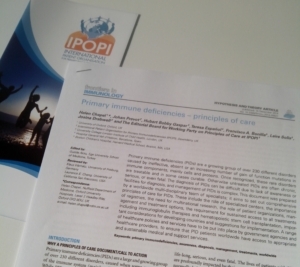 The PIDs Principles of Care cover the following aspects: the role of specialised centres, importance of registries, the need for international collaborations for scientific research, the role of patients groups, management and treatment options for PIDs, and management of PID diagnosis and care throughout the world.